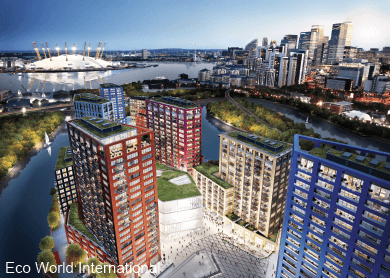 WITH four international projects — three in London and one in Sydney, Australia — in the pipeline, Eco World International Sdn Bhd (EWI) is ready to make its mark on the global stage. EWI is a sister company of Eco World Development Group Bhd and was set up for a special purpose acquisition company (SPAC), Eco World International Bhd, which is awaiting approval from the Securities Commission Malaysia. 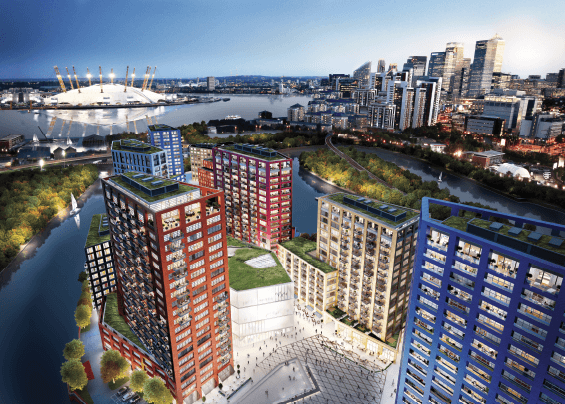 The first of the four projects to be launched is London City Island (LCI) in the UK. LCI, which has an estimated gross development value (GDV) of £614 million (RM3.43 billion), along with Embassy Gardens (£995 million GDV) and Wardian London, formerly Arrowhead Quay, (£591 million GDV) will be developed under Eco World Ballymore Holding Co Ltd (EWBH), a joint venture between EWI and UK-based developer Ballymore Group. Ballymore is an international real estate development group specialising in the London market, especially in regeneration projects building neighbourhoods, places and communities. EWI is taking a 75% stake in the partnership and Ballymore, the remaining 25%. “Ballymore will also remain as development manager, which we are very happy with. We still control the operations but execution is carried out by Ballymore,” says EWI CEO Datuk Teow Leong Seng. Teow was formerly the chief financial officer of S P Setia Bhd. While Teow and the team already have experience developing in London with Battersea Power Station (BPS), having Ballymore as a partner is important and is an “easy way for EWI to enter the London property market”. BPS is owned by the consortium of S P Setia, Sime Darby Bhd and the Employees Provident Fund. Tan Sri Liew Kee Sin is the chairman of Battersea Project Holding Co Ltd, the special purpose vehicle owned by the consortium, and also the non-independent non-executive chairman of Eco World Development Group. “We learnt from our experience with BPS. It took us two years to build the team up to a staff force of 120. So, instead of having to do that, Ballymore comes in and helps ease our way into the London property market,” shares Teow. While EWI’s deal with Ballymore was the result of winning a tender by the latter, Teow and the team have known its chairman and founder Sean Mulryan since the development of BPS. “Ballymore wanted to tender these three projects and we saw that it was attractive as we get three projects in three different locations with different price points. This works for us because we can accelerate our launches. You can’t do that with a big project in a single location. So, the return on investment is much faster because we are able to launch the projects faster,” explains Teow. The three projects will have a total of 2,800 residential units with an estimated GDV of £2.2 billion. EWI plans to inject the Sydney A$300 million residential project – West Village – and the three developments in London into the SPAC. The 12-acre LCI was launched simultaneously in Kuala Lumpur and London on May 30. LCI is located in the Leamouth Peninsula. It is within 1.5 miles of Canary Wharf and three miles from Olympic Park in Stratford. “LCI is conceptualised to be complementary to Canary Wharf, which is four minutes away by the public rapid transit system. Canary Wharf is a business park that offers employment while places like LCI offer accommodation. The residences in Canary Wharf are more expensive while those in LCI are about 40% cheaper, so we are more affordable,” says Teow. According to Teow, LCI is located within one of the most high-profile and important regeneration areas in East London, which is expecting a wave of investment of about £2.5 billion that will transform the riverside between Canary Wharf and Royal Docks. Due to its island-like setting, LCI was masterplanned in a Manhattan style by Skidmore, Owings & Merrill of Chicago. “We have maintained the original design. The masterplanner likened LCI to the Manhattan waterfront with a touch of Chicago’s waterfront,” says C Y Tan, EWI head of technical design & planning, international business. Leamouth was once an industrial zone and the East London’s docks were the hub of Britain’s global trade. “The building architecture was by British architect Glenn Howells. Howells looked at the history of the docks where there were once a lot of brickware houses. In more modern times, the containers came and were stacked one on top of the other. Borrowing from that kind of aesthetic and the colours of the containers, each block will have a different colour. The design is very true to this part of London,” says Tan. “A lot of projects I have seen tend to be very monotonous. LCI will be very vibrant due to the contrasting colours. LCI is 12 acres of blank canvas to masterplan, which is very hard to get in London. We had a blank canvas with BPS and Embassy Gardens but not in much of London,” says Teow. Phase 1, comprising four blocks of apartments, has been almost fully sold by Ballymore. It is under construction and will be delivered in two to three years from now. Phase 2, which EWBH is developing, comprises six blocks of apartments. The mixed-used development will also have a small retail component to cater for the needs of the residents as well as the 8,000 sqm Arts and Culture Hub for arts, culture and performances, which Teow believes will add sophistication to the development . The six blocks are arranged around a square and the Arts & Culture Hub and will have views of the O2 Arena and Canary Wharf. Public amenities include landscaped parks and public spaces, a social club, heated outdoor swimming pool, concierge service, gym, village shopping, F&B outlets and spa. The apartments will have fully fitted bathrooms, kitchen and integrated wardrobes in the bedrooms and double-glazed composite windows. “We have launched two blocks (417 units) as part of our first launch (Phase 2A). We will have three launches of two blocks each. That will be easier for us as two blocks will about 400 units, making it a nice size for a launch,” says Teow. LCI will have a selection of suites and 1 to 4-bedroom units and the newly launched two blocks are priced at an average of £800 psf. Sizes range from 400 to 1,400 sq ft.
Teow believes its location makes LCI “compelling in terms of value for money and connectivity”. “There will be a new pedestrian bridge providing access to Canning Town Tube station on the Jubilee line and Docklands light rail. Canary Wharf is just two stops away, eight minutes to Stratford and it takes less than 20 minutes to get to Bond Street in central London. The new Crossrail transport link, which will start in 2018, allows you to travel to Heathrow Airport in 40 minutes from the Canary Wharf station,” he says. “LCI is about a third of the price of residential properties in Central London, which ranges from £2,000 to £5,000 psf. We are selling at an average £800 psf for a place that is 20 minutes away from central London,” says Teow. Like any other city, prices of properties increase as one gets closer to the city centre. “The further away you are from the city centre, the cheaper it gets. I think for our location, we offer fantastic value for money. For people who travel in and out of London city and central London, it’s a good deal. “Developments around LCI are about the same price ... some were launched earlier and would be cheaper. LCI would be slightly higher than some, but I think we offer one of the best location, connection and masterplan. It’s not comparing apple to apple, you have to take LCI as a whole package rather than individual parts,” says Teow. EWI held a preview in KL on the weekend of March 28 and the 217 units allocated for the KL market arealmost fully booked. “We are looking at KL, Singapore, London, Hong Kong, China and even the Middle East for our projects. However, it depends on the response. Like in the case of LCI, if we managed to sell the two blocks in KL and London, then there is no point for us to go further. “Having said that, China is one market we can’t ignore, especially for the London market as the Chinese are starting to come into London in a big way,” says Teow. EWI will be selling units in a new block in Hong Kong on June 7 as it foresees very good response in KL and London, according to Norhayati Subali, EWI divisional general manager, sales and marketing, international business. “We are taking the allocated units for the Hong Kong market for the KL market as the initially allocated 217 units are almost fully booked. So, we will still have good units to sell on the launch day and Hong Kong buyers will have a new block to buy from,” she says. Construction is expected to start in 4Q2015 and completed in 1Q2018. EWI expects to roll out the other three international projects by end-2015. Investors adopted a wait-and-see stance in the months leading up to the UK’s general election in May, causing a slowdown in the property market. “It was quiet during that period; we saw it in BPS. But in general, I think the properties priced above £1.5 million were more affected than those priced below that,” says Teow. Now that the general election is over, Teow expects the market to perform strongly going forward. “We noticed that since the general election, there has been a resurgence of inquiries. Because our products are largely affordable and the market segment is mixed, we are not just dependent on foreign investment. Wider London residential prices have increased by 8% per annum over the last 20 years and the outer fringes of the city are now seeing a positive price ripple effect. About 90% of our units are priced below £937,000, which is the price threshold where Stamp Duty Land Tax (SDTL) is lower under the new legislation introduced last year to assist purchasers of affordable homes. So yes, we believe our prices are within the reach of most Londoners,” says Teow. He notes that London, being a global city, has a healthy rental market. “In a city such as London where there is a huge itinerant population due to its status as a global financial, economic, educational and cultural hub, the demand for dwellings is very strong. “Much of this demand would come from people who may only be there for several years. For this group, it may not make sense to own a property in London. This has resulted in a very active rental market, which in turn has led to the development of highly skilled and professional real estate services providers to match tenant and owner requirements,” says Teow. While affordability has been a concern in London, Teow notes that it mirrors those in most highly developed cities around the world. “The key problem is scarcity of supply and the lack of developable sites leading to a significant mismatch of demand and supply which has driven prices up,” he says. He estimates the rental yields across London to be 3% to 4% on average and he does not expect the yields to change very much as it is reflected in the prices. Knight Frank’s April Prime Outer London Index showed that annual rental values grew 1.75%, the highest rate in three years, while gross rental yields were 3.49%. It also reported that viewings rose 26% in year to April while tenancies commenced rose 42%. Tan says property consultants such as Knight Frank and Savills have noted that there is a push towards East London in the last one to two years. “They have identified the regeneration triangle of Canary Wharf, Royal Docks and Queen Elizabeth Olympic Park in East London as hot spots. People are moving there because they are cheaper compared with more developed parts of London,” says Tan. Knight Frank’s report on “Eastern Opportunity Regeneration and Development in East London 2014” says the hot spots in the regeneration triangle combine to create the most significant concentration of development and regeneration activity in London. “As Europe’s largest and fastest growing city, this is where a large part of London’s future growth will be accommodated. Links to the rest of London will be noticeably improved by the opening of the Crossrail high-speed train line in 2018. The line will drastically cut travel time across London, and will link the area to the capital’s other key areas of business and wealth creation in the city and the West End,” it says. Teow believes the London property market will be driven by its population, which has grown 12% over the past decade, and increasing employment. “The population is expected to increase by another 14% by 2021, and businesses have diversified beyond banking and finance to technology and media. This will increase the demand for housing. “London remains the top global destination for international real estate investments, and is widely acknowledged as one of the most investible and liquid real estate markets. The wider London market has outperformed most other global investment asset classes due to chronic housing shortage. Current supply is meeting less than 50% of the demand. All these factors bode well not just for LCI but also the other two London projects,” he says. This article first appeared in City & Country, The Edge Malaysia Weekly, on June 1 - 7, 2015.